These crochet amigurumi gingerbread boy and girl are the perfect little holiday project. 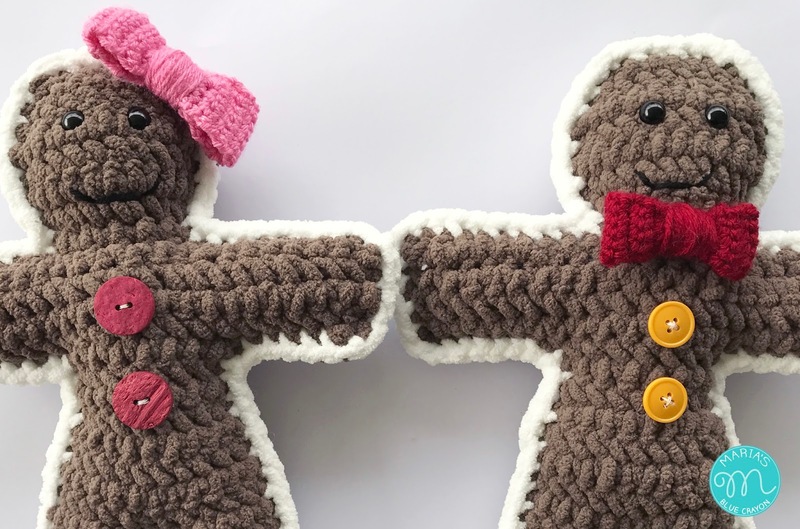 This free crochet pattern comes with a video tutorial to help you make your own gingerbread stuffy. Make one for your favorite little in your life or use it as a cute addition to your home decor. Scroll down for the free pattern and the video tutorial. If you participated in my Christmas Granny Square Afghan CAL, these gingerbread may look familiar! They are made with the same basic construction as the gingerbread applique for the afghan, except they are larger and 3D! 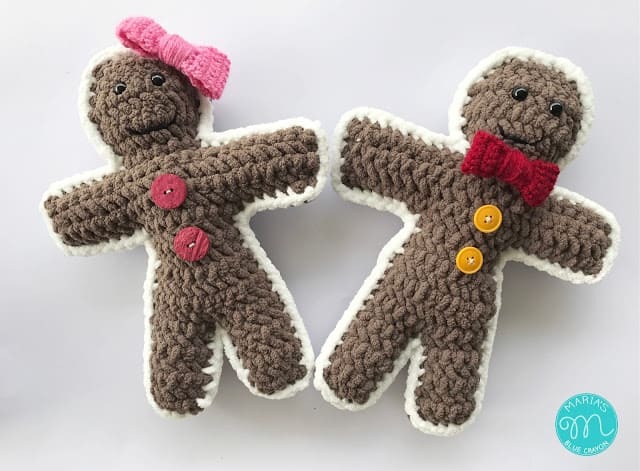 Unlike traditional amigurumi, these gingerbread are made by crocheting in rows rather than rounds. Two 2D shapes are made and sewed together with a bit of stuffing inside to make it 3D! This pattern only calls for chains and single crochets, so if you know how to do those two stitches, you’re all set! Get creative as you’d like! As you can see, I made a girl and a boy by just moving the bow and using different colors for the bow and buttons. 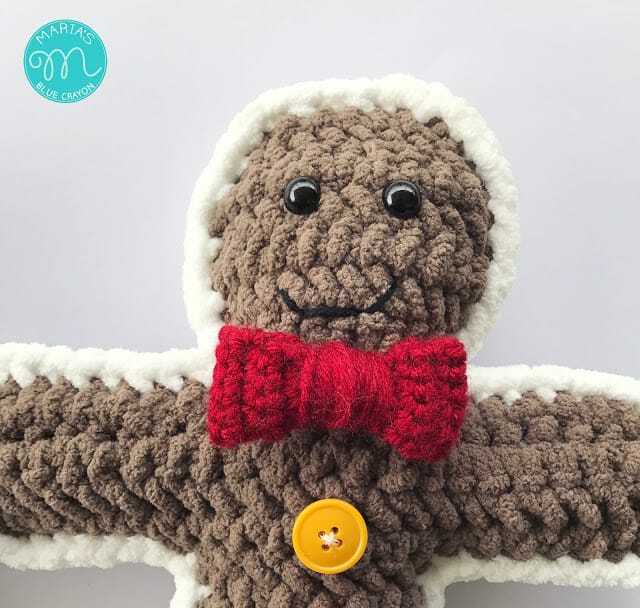 I used Bernat Blanket for a soft and cuddly feel but you can easily double up a worsted weight yarn or use a different bulky weight yarn to achieve the same gingerbread boy or girl. PURCHASE THE AD-FREE PDF DOWNLOAD/PRINTABLE HERE. Sharing in any way you can really helps my blog going and the free patterns coming – thank you! The gingerbread will be made by making (2) 2D shapes then crocheting the edges together with a bit of stuffing inside. Make 2 gingerbread shapes, we will crochet them together in the end. Embellish one side of the gingerbread with eyes, mouth, buttons, and bow. Sew Row 1 to Row 28 with a tapestry needle. Making sure the seam is centered, cinch the bow and wrap yarn around the center until you have about 6 in of yarn left. Secure bow by tying a knot with the yarn on the back. To assemble the gingerbread, hold both pieces together lining up the stitches. Using the Bernat Blanket yarn in white, attach yarn through both pieces, ch 1 and sc around the gingerbread going through both pieces. About ¾ around, stop and stuff the inside with polyfil. Continue to sc around and stuff as you go. Sc to the first sc and fasten off. Weave in ends. I’d love to see your creations! Tag me over on instagram @mariasbluecrayon or join my yarn friends group on Facebook to share!